Manawa: A Shaman’s Journey ©: The Sarayaku Kichwa Indigenous Community (of the Ecuadoran Amazon Rainforest) and Henry S. Cole & Associates, Inc. have joined forces to produce a fictional movie–one that will portray the struggles of indigenous peoples to protect their their rainforest communities – from the ravages of oil, mining, agri-business and other threats. We plan to use Sarayaku community members the cast and crew needed to produce the film–with support from supportive professionals in the motion picture industry. I am working with Eriberto Gualinga on the movie’s screenplay which will incorporate the rich experience of the Sarayaku. Mr. Gualinga has a long record of producing and using documentaries as an effective tool in the in the Sarayaku resistance to big oil backed by the Ecuadoran government. His incredible film Children of the Jaguar won the Best Documentary award at the National Geographic All Roads Film Festival in 2012. Despite this victory (2011) and an apology from the government of Ecuador, the government announced in December a grant to a Chinese Oil company to exploit the oil reserves within the territories of the Sarayaku and several other indigenous peoples. We are indigenous women …. who learned in silence and pain to say: No Contamination, No illness, No Oil. From the first conflict with oil in the 1990’s to the present, the Sarayaku have come up with ingenious ways to protect their community and the “living forest.” They have developed considerable expertise in using technology (internet, solar energy, and aviation) but without compromising their sacred harmony with nature . Children of the Jaguar depicts the Sarayaku’s successful use of the Inter-American Court on Human Rights to challenge oil development on its territory. My trip to the Sarayaku community. This past February, I spent several weeks with the Sarayaku and I was able to meet with many community members, go deep into the rainforest, experience fishing, farming, and family life and to collaborate with Eriberto. Our project and partnership received formal approval from the Sarayaku government council. Defenders of the Rainforest. While there is general recognition that preservation of the rainforests (the lungs of the earth) is essential in efforts to curb runaway climate change, neither international treaties or reforestation efforts have prevented the rampant destruction of global forests for the extraction of resources. On the other hand, the evidence clearly demonstrates that indigenous peoples are the most effect defenders of rainforests and other ecosystems. This Google Earth Image shows a developing (light) area (west of the dashed line) and the forested area (solid dark green) including the Sarayaku territory to the east. Guardians of Humanity: My experience was beyond anything I had imagined. I began to see that the Sarayaku (and many other indigenous peoples) have a great deal to teach we “the developed world,” the we the “civilized.” Here is a people that with a deep spiritual belief that all life is sacred. Their livelihood depends on a harmonious relationship with nature. If you want to see true democracy in action sit in on a session of the Sarayaku governing council, open to all voices. Here is a people with great love for family and community. The fully understand that “no man is an island.” Children are taught at the earliest age to participate and contribute, to feel like they are part of something much bigger than themselves. One of the principal goals of our movie is to give people a vision and hope that there is an alternative to the growing economic, social and environmental dysfunction of our times. Her tuber-haul basket is sized just right! Why Fiction? There are many excellent documentaries on issues related to climate change, sustainability and the the threats to indigenous peoples. Our goal is to bring the film’s messages to bring greater awareness to wider audiences using the elements of drama: suspense, intrigue, shamanism, vision quests, and romance. The Sarayaku experience and lore provides a stunning set of circumstances for our story–the beauty and perils of the rainforest, anacondas and the jaguars, the battle of the shamans good and evil, passionate love (that may or may not happen), the oft-veiled but pre-eminent power of women, the mysterious beings of forest and river that demand respect for nature. And there is the courage of a people who battle the oil companies and their corrupt allies in government. Imagine a scene which re-enacts how the women (as pictured above) were able to confiscate the automatic rifles from government troops ! Manawa’s journey: The personal stories of Sarayaku leaders also provide the ingredients for the arc of main character. Manawa is the oldest son of the community’s elderly shaman, Don Selvino. The shaman or “yachaq” (Kichwa), trains Manawa for to become a powerful shaman and leader in the battle to protect community. However, Manawa must overcome the temptations that all shamans-to-be must face, a life of lust and power offered by the evil shaman (brujo). But he must take up life in Quito in order to gain political and legal support required to fend off the pending onslaught. The capital city has its own temptations and rampant discrimination against “indios”. What happens? Stay tuned. Final note: Living with Sarayaku families gave me something else: An intangible feeling of well-being that comes from the human heart and draws from the roots of the forest, our own human roots. I am sure that my deep encounter with Sarayaku’s beloved Shaman Don Sabino helped me discover this place. Sarayaku Governing Council Gives Official Green Light to our movie project ! This just in from Eriberto Traya Muskuy Gualinga (Facebook): “Henry el consejo de gobierno esta acuerdo con la carta de intencion.” (See this short video by Eriberto made one year ago, before I knew him. It is amazing how similar our visions, and the path that brought us together). Mario Melo, the Sarayaku’s attorney and Sarayaku official Franco Viteri in Washington, DC on April 4 to protest Ecuador’s squelching of the right to assemble. Inter-American Commission on Human Rights on April 4. The Commission is an autonomous body of the Organization of American States (“OAS”) whose mission is to promote & protect human rights in the American hemisphere is composed of seven independent members. I will be attending the hearing and meeting with the the two Sarayaku reps. (Stay tuned). Quito and the trip to Sarayaku: I arrived in Quito late Monday night (Feb. 8) and was picked up by Yury Guerra (Altruvista’s South American Director (now a great friend). We spent a couple of days in Quito for meetings with Mario Melo and Esperanza Martinez (Accion’ Ecologica) to get background on the Ecuadoran government’s oil deal with a Chinese company that would affect the Sarayaku territories and those of other indigenous peoples. Quito, an amazing city about 9,000 feet high in an Andean valley; it’s a very live city with a great deal of culture, music, and history. I stayed at the Cafe Cultura, whose walls are covered with beautiful imagery, as shown below. If you’re looking for a comfy place with a an international clientele and friendly hosts (all speak English), is is the place to stay! A later post will focus on the Guayasamin Museum & the works of Oswaldo Guayasamin, Ecuadoran artists (1919-1999). Much of art portrays the repression, enslavement, and genocide of people by repressive dictators in Latin America and other parts of the world. More on Quito in later post, but before leaving I want to show you a bit of street show that I was lucky to see because it was Carnival. Click to see the movie. See if you can figure out what’s really going on. Here is wide angle view of Quito, Ecuador “Diego Delso, Wikimedia Commons:, License CC-BY-SA 4. followed by a close up. The Sarayaku territory is located about 60 km east of Puyo in the Pastaza province of Ecuador (see map). To get there from Quito Yury and I first took a five hour bus ride from this Andean city to the small city of Puyo located at the edge of the Amazon Rainforest. The change in topography, weather and vegetation is stunning. From plain to forest, from cool and dry to warm and humid. Along the route I managed to get a photo of Mt. Cotopaxi. Yury Guerra tells me that a decade ago the ice and snow covered the mountain—undeniable evidence of climate change. Blowup showing the steep drop in altitude from the Andes Mountains to the Amazon Basin, a change in topography matched by changes in climate, vegetation and living conditions. We arrived in Puyo late on Thursday evening February 11 and checked in at a hotel. I was nervous because this was my first meeting with Eriberto Gualinga, whose award-winning documentaries on his people’s resistance to oil development inspired my trip. His support for collaboration was make or break. Eriberto, his brother Gerardo and Yury and I sat down to dinner in a rustic outdoor café. With Yury as interpreter (Spanish/English), I explained my concept. Eriberto listened with a poker face. After about an hour and many questions, his face lit up. He said he had been thinking about a very similar idea for a movie that we should put our ideas together and share them with other Sarayaku leaders. I was ecstatic—especially after a few more rounds of cervezas. On to Sarayaku! Hank and Eriberto with Yury (dark jacket), Sarayaku Aviation manager (red shirt). Sarayaku Aviation; pipeline for people and supplies from the Sarayaku community to Puyo. To get from Puyo to the Sarayaku community you can either go by motorized dugout, a 4-6 hour ride depending on current, or by air. It’s a 25 minute ride possible only when it’s not raining and the cloud ceiling is high enough on both ends of the trip. We were lucky. After a few hours Eriberto, Yury and I were able to board a 3-passenger single engine Cessna owned and operated by and for the Sarayaku. The fact that the Sarayaku own and operate an aircraft company provides a lens into this remarkable people. Over the past few decades, the Sarayaku have selectively modernized, and have done so in order to survive. We talked with the manager of Sarayaku Aircraft who told us they started the company from scratch with the help of experts, much training and some hard to get loans. Now we see a first class aviation outfit with pilots, engineers, mechanics, et al. Once in the air we were able to witness the final descent from the edge of the city, to a patchwork of forest and farms, a last line of cliffs, and then a continuous expanse of forest broken only by meandering rivers. Now the pilot begins the descent through the turbulent air. We catch a glimpse of thatch-covered buildings and the grass-covered runway. The plane hits grass with a jolt and taxies bouncingly toward a cluster of people—children, big and small, running, shouting, men and women with loads for the return flight. And there, standing in the grass with his white walking stick, is the 96 year-old Shaman Don Sabino. As we alit there is a joyful commotion. Everyone, especially the kids, knows and loves Yury. I shake a few hands, he gets a lot of hugs. Manawa: A Shaman’s Journey: As many of you know, I’ve been working a fictional film for the past two years. The film, under development will portray the current struggles of indigenous peoples to protect their their rainforest communities – from the ravages of oil, mining, agri-business and other threats. I spent much of February visiting the Sarayaku Kichwa indigenous people of southeastern Ecuador’s Amazon Rainforest. The purpose of the trip was to learn and to explore the possibility of partnership with the Sarayaku community. The trip fulfilled both objectives far beyond expectation. This series of posts will describe what I saw, and the deep impact my experience with the Sarayaku had on me. Eriberto Gualinga, spent hours envisioning the movie and put together a summary and letter of intent describing the movie including the intent to maximize the men, woman and children in the acting and production of the movie. Update: Last week (March 15), The Sarayaku government formally agreed to partner in the development and production of the movie. Why a Big Screen Drama? There are many excellent documentaries on the topic; however, we believe that a “big screen” movie packed with action, suspense, passionate romance, the beauty and perils of the rainforest, the mystery of shamans (both good and evil), passion and romance, can greatly expand audiences and public awareness. I chose to approach the Sarayaku for several compelling reasons. They have in-depth experience with film making and have been successful in using documentaries as an essential element in their decades long struggle to defend their ancestral territory from oil development. Eriberto Gualinga’s Children of the Jaguar won the Best Documentary award at the National Geographic All Roads Film Festival in 2012. Secondly, to defend their existence, the Sarayaku have modernized selectively, embracing technology, communications, political alliances, and the courts, though always in ways that preserve and enhance their culture and their sacred relationship with nature. Through their fierce determination, courage, and savvy, they have been successful. Yet their struggle continues. A few months ago, the government of Ecuador announced it had issued concessions to a Chinese oil company. (More to come). The movie will be filmed on location and most of the cast will be Sarayaku women, men and children. We will use the project to train members of the community in all aspects of film production, using outside experts as advisers. I will work with Eriberto Gualinga and others to revise the original screenplay to more closely fit the history and circumstances of the Sarayaku people. Mr. Gualinga will serve as principal director with coaching from an accomplished director with a record of human rights and environmental advocacy. Development: In the next few months, I will be giving a series of presentations to environmental organizations, film boards and foundations to raise funding for the project. We will also plan to bring Eriberto Gualinga to the U.S. for a speaking tour to enhance these efforts. Moreover, we will use every step to foster media coverage to boost support for indigenous peoples and their rights. Critical messages: There is broad understanding that preservation of the world’s rainforests is necessary to curb runaway climate change and preserving the planet’s biodiversity. The movie, however, will emphasize a less appreciated point: The best way to preserve rainforests is to protect the rights and territories of indigenous peoples, the guardians, who have lived in harmony with nature for thousands of years. ↑The Google Earth image shows deforested areas (light colored) in the developed area east of the Andean highlands. Further to the east, the the undisturbed rainforest is solid dark green; this area includes the Sarayaku territory. The children contribute to the work of the harvest. Living with Sarayaku families gave me something else: An intangible feeling of well-being that comes from the human heart and draws from the roots of the forest, our own human roots that we “the civilized” must learn to nourish. One of the objectives of the film is to contrast this compassionate respect with the uncaring greed, avarice and brutality imposed by profit-driven multinational corporations and complicit governments. Join our journey: Please share this post. If you are interested in organizing a fundraising event or to support this project, or know of others who might be interested, please contact me at hcole@hcole-environmental.com or call at (301) 780-7990. Contributions: You can contribute at our Indiegogo site and thank those who have already done so! Chronology and acknowledgements: Many people have contributed in a various ways to this project. The idea for the movie first emerged more than two years ago during a film acting course at the New York Film Academy to celebrate my 70th birthday. I realized that my real passion was storytelling rather than acting. Michelle Best our acting prof gave our class a one-page, bare-bones dialogue. In it an elder tells a young man to avoid an a disastrous confrontation. I shaped the story: A yoga mat became a dugout canoe, the floor a river in the rainforest; the old man (me, a shaman), and my young classmate (his impetuous protege). After several takes, I found my inner shaman. Weeks passed and I couldn’t get the story out of my mind. Something was pushing me, perhaps an indigenous whisper from childhood? The lore of nature and mysticism? I wrote a 30-page “synopsis,” for a full movie. I thank Michael Laibson , another NY Film Academy faculty member and past producer of some of TV’s most celebrated soaps for his sage advice and continued encouragement. I delved, read, went to conferences, talked to anthropologists, met with touring indigenous shamans and leaders and watched lots of documentaries. My conviction to tell a story, one with a message about the humanity, dignity and courage of indigenous peoples and their struggle to survive the onslaught of profit driven development. The Shaman Speaks: In this photo taken at a 2014 conference in San Francisco, I meet with Davi Kopenawa, a Yanomami shaman from the Brazilian province of Amazonas, and an international leader in the struggle to preserve the rights and territories of indigenous people of the indigenous rights movement. Kopenawa, a true shaman of the “two worlds,” is an important source of information and inspiration. See his book, The Falling Sky, which describes his personal history and the spiritual basis for the Yanomami relationship with community and nature. The dismal art of screenplay: A screenplay is not like a book, where anything goes. If you don’t follow every one of many exacting format rules, your masterpiece will wind up in a producer’s overflowing wastebasket. So I took a course at the Washington Writers’ Center where I met Monica Lee Bellais, screenwriter and producer, a “shaman of the scripts” who helped me to craft a solid screenplay. But…. Mr. Gualinga’s Children of the Jaguar (online) portrays how the Sarayaku people stopped oil development through the Inter-American Human Rights Court of the Organization of American States (OAS). The movie won Best Documentary at the National Geographic All Roads Film Festival in 2012. This movie was instrumental in my decision to travel to Ecuador in order to learn and to see whether collaboration with the Sarayaku was possible. My trip to Ecuador last month (Feb. 2016) was arranged by Malia Everette, President of Altruvistas, and Yury Guerra, Altruvista’s South America Program Director who served as my trip organizer, interpreter and companion, Yury, who opened both doors and hearts. My visit with the Sarayaku Kichwa community was one of the most profound and moving experiences of my life. For this I give thanks to Don Sabino, the great shaman, his wife Dona Corina, to their daughter Patricia Gualinga and to their sons, Gerardo Gualinga and Dona Corina. From the Gualinga family and many others, I saw a people who live in harmony with nature, who work hard for their basic needs, and who do so with a sense of purpose, joy and a deeply felt desire to give back. I feel that so many people are sharing this journey. I imagine hundreds of dugouts on the Bobonaza River. Family and friends, co-conspirators. Children going to school wave to us from the bank. Will it rain? Will we catch fish today? How deep is the water? Paths of mud and stone. The sacred tree’s giant buttresses dwarfs the hunters. The smile of a woman. Feathery yellows, blues and reds. The scent of flowers. Now the dance. Every two years the Sarayaku men go on a hunting expedition that lasts for several weeks. (Link to video). The tapirs, monkeys, pigs and fish taken are preserved with smoke and fire. The hunt finished, the men return in canoes; their faces painted, their heads adorned with brightly colored feathers. The women have prepared a great feast and when the men arrive with their bounties, the celebration begins and goes on for four days. Why every other year? So large a harvest each year would threaten the populations of game on which the Sarayaku depend. Stay tuned: The next posts, with lots of photos, will detail my visit with my gracious hosts, the Sarayaku Kichwa Indigenous People of the Amazon Rainforest. And you’ll learn more about the movie as the journey unfolds: Coming Posts. Stay tuned. The new threat from oil (The government’s new oil concession a Chinese oil giant. Hunting, Fishing, Farming: What’s on the menu? The local tribes people greet Columbus and crew with fruits and gifts. (Public Domain Image). What are we celebrating? Most of us Euro types wouldn’t be here if it weren’t for the heroic journeys (4 of them) that brought him (with Spanish crews and ships) to the Americas. But for Americans already here before Columbus, there isn’t much to celebrate. What can only be called genocide started early on as Columbus and the Spanish began to colonize indigenous peoples of Hispanola (now Haiti and the Dominican Republic) and other islands. Here are excerpts from the late (great) Howard Zinn’s A Peoples History of the United States based on historical documents. Forward in Time: In the U.S. colonists and settlers backed by government troops carried out ruthless repression resulting in the displacement and deaths of millions of Native Americans. We needn’t look very hard to find genocide in our own history. But what about now? The evidence indicates that multi-national corporations–with the backing or and complicity from governments–are trampling indigenous people, their rights and their territories in develop mines, plantations, logging operations, oil and gas, and hydroelectric power for profit–maybe not in the name of “the Holy Trinity” but certainly in the name of economic growth. This is happening all over the world, and especially in the Amazon rain forests of South America. 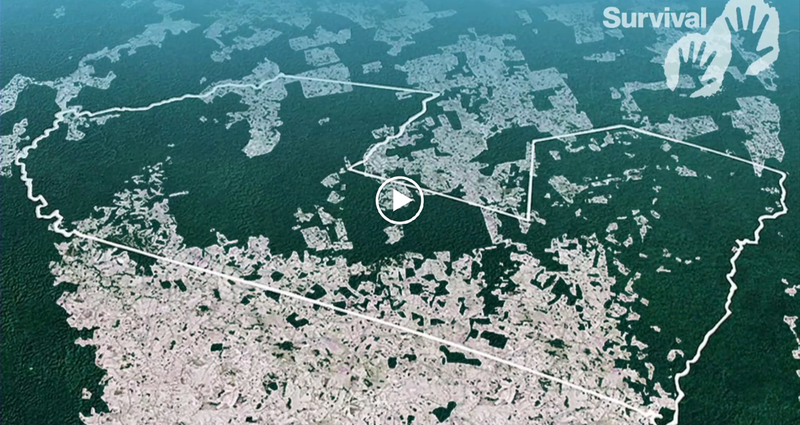 Videos tell the story: To get an idea of the struggles of indigenous peoples in the Amazon region, we invite you to take a look these videos. The Awa of Brazil: Survival International’s successful International’s efforts to save “The Earth’s Most Threatened Tribe” from illegal logging. Indigenous peoples stake on Big Oil. See video from Amazon Watch. 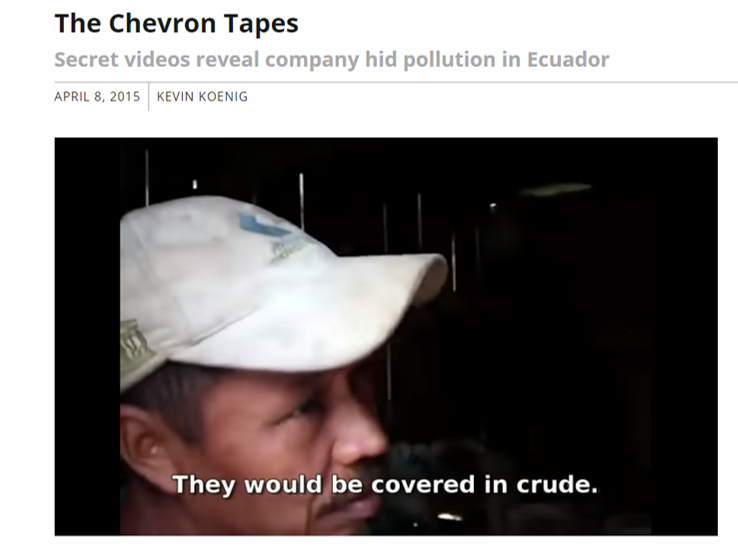 Chevron and its Secret Videos: A whistle blower provided NGOs with a videos that Chevron’s reps took in Ecuador. There mission was to find evidence showing the place was clean and safe. They didn’t have much luck, hence the kept them in the closet. See it here. 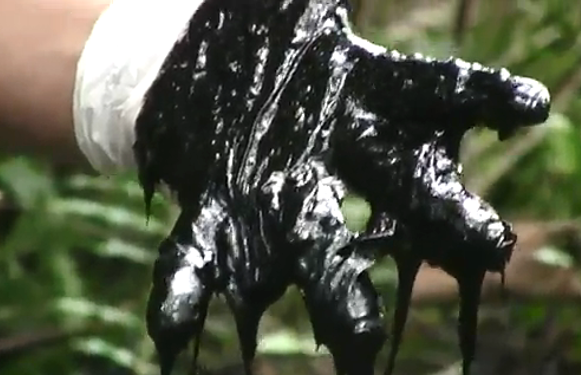 In one sequence a poor farmer says that his children were exposed to oil and died. Good News on the Legal Front (Bad for Chevron). The Supreme Court of Canada ruled unanimously that 30,000 poor Ecuadoran farmers can sue Chevron on trial in Toronto, in an effort to seize $9.5 billion from its Canadian subsidiary for damages from the pollution the company’s drilling caused in vast stretches of their territory. See news story here. What you can do on Columbus Day Week. Go to websites of two fabulous groups working on behalf of indigenous tribes: Amazon Watch and Survival International. You will find a wealth of information and additional videos. Then take two steps: Sign critical petitions and donate. Let’s not allow history to repeat. More than 30% of the Awa territory has been destroyed by illegal mining. Chevron agent interviews poor farmer. Explains why tapes were hidden. Click to sign on> Please sign on the petition! Oak Flat – a centuries-old sacred site for Native Americans – was handed over to an international mining conglomerate by Congressional Republicans earlier this year. Pass the bipartisan Save Oak Flat Act to repeal this shameful land trade immediately to protect this sacred Native American land. Last year, Republicans in Congress secretly gave away sacred Native American lands to a multinational mining conglomerate. If this deal is finalized, these sacred Native lands could be destroyed permanently. It’s true: National Defense Authorization Act – a bill President Obama could not easily veto – included a non-germane and shameful provision mandating a land swap long favored by a mining firm called Resolution Copper. Congress gave this international mining conglomerate, which is co-owned by Rio Tinto and BHP Billiton and have “dismal human rights and environmental records,”(1) exactly what they wanted at the expense of sacred and religious sites connected to these public lands. A bill to right the wrong: On June 17, I (Congressman Grijalva) introduced the bipartisan Save Oak Flat Act to repeal the land trade while leaving the defense law intact. Congress should not be in the business of helping big corporations at the expense of others, and it certainly shouldn’t break faith with Native American communities. For years, Resolution Copper has sought access to a copper deposit in eastern Arizona at a site called Oak Flat, which has been home to the San Carlos Apache Nation’s traditional acorn and medicinal herb collecting and religious ceremonies for centuries. Oak Flat itself is a significant cultural site for the San Carlos Apache. The mountain’s waters feed Gaan Canyon, a significant cultural and religious site. The location also includes Apache Leap, an escarpment of equal cultural importance. The San Carlos Apache fear their sacred lands will collapse or be damaged by the intensive block cave mining Resolution proposes. However, their concerns have fallen on deaf ears. Last Congress, Republican House leaders had to cancel a vote on their bill forcing the Forest Service to trade the land to Resolution due to overwhelming opposition in congress. Undeterred, Arizona’s Republican Senators snuck a swap provision into the defense bill during conference, knowing it could not be removed by the House – or easy for President Obama to reject. Now the San Carlos Apache are facing the imminent prospect of permanent damage to their sacred sites. The line on treating Indian Country(2) with disrespect must be drawn. It’s time for Congress to do the right thing and uphold its commitment to Native Americans and protect their sacred lands. I’m proud to lead this bipartisan fight, and I’m asking for your help to get the word out! 2. “Indian Country” defined at 18 U.S.C. § 1151, epa.gov.